This is a post I never got around to posting because it took me awhile to get it together to upload and edit the pictures. 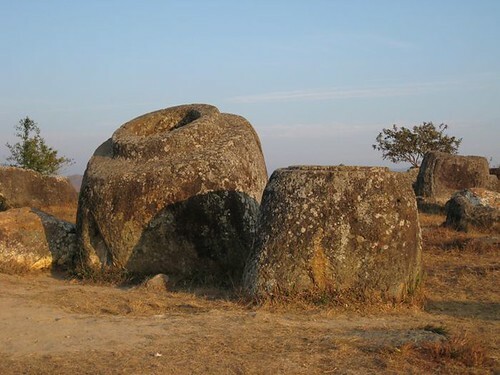 I took the pictures when I visited the Plain of Jars on Saturday. POJ 5 jan 08, originally uploaded by c_p_lew. 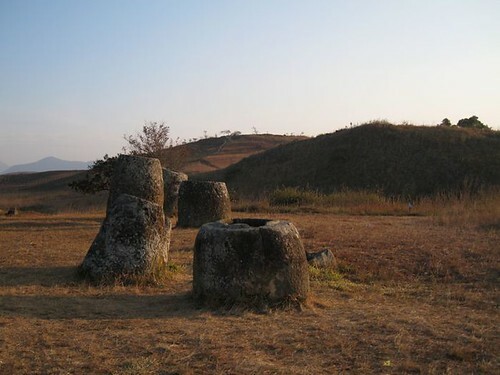 I think I've been here thousands of times, but somehow I never get tired of visiting the Plain of Jars. The first day I arrived in Phonsavanh in 1996, I suggested to the staff who had been working in the project, that we go out there. The expatriate who was working there at the time rolled his eyes. "You'll get tired of it soon enough," he said. "I'll take you but you have to promise that you'll bring guests out there when they want to go." I agreed. That day was freezing cold with a wind that spun around the jars isolated on the wide hills. Since it was in November (and the dry season), the grass was already dead and dry, and looked as gray as the sky. We ran around the hills and the jars. I felt exhilarated to be out there, in the wind and weather. I think the staff were grumbling but if they were, their words dissipated in the wind. Since then, I've brought guests out there, including people who live in the province and had never been there. And I often go by myself, on days like this, when the light of the setting sun sets the landscape on fire. So who made these jars, and how did they get there? There isn't a lot of information - there are about fifteen jar sites around the province. At some of the sites, there are remains suggesting that the jars were funerary urns. This site, also called Ban Ang (Basin village) is the largest site that has been excavated since it was close to Phonsavanh - which also meant that it was easy to be vandalized. And it was also a main battlefield during the 'Vietnam War.' There are big bomb craters scattered among the jars, the aftermath of 2000 lb. bombs. Unesco article. A few years ago, they contracted the Mines Advisory Group to clear the main foot paths of UXO. biggest jar, originally uploaded by c_p_lew. 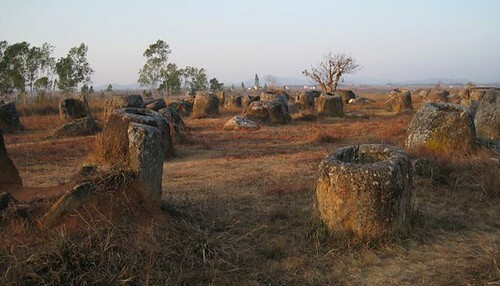 view of the Plain of Jars, originally uploaded by c_p_lew. nteresting post, i did not know they existed! You took some great pictures there, that warm sunlight gives it a very special glow and feeling! This is a wonderful post with pictures that almost makes up for me not getting to see them. Thanks for you references too.